Organic restaurant whose ingredients are either grown on site or sourced from local producers. Set amid a 130 acre estate which you are encouraged to explore. Both Dartmoor and the South West Coast Paths are within easy reach. Granite Way is very close by. Plenty of National Trust Houses and gardens in the vicinity. Percy's is pretty unique in every way. We grow our own produce, farm our own meat and offer fantastic grounds with stunning views, beautiful woodland and wildlife ponds. The rooms are spacious and very comfortable, the food is second to none and what is more, we are situated in the middle of Devon and Cornwall, so we are well positioned for exploring the fantastic countryside around us. 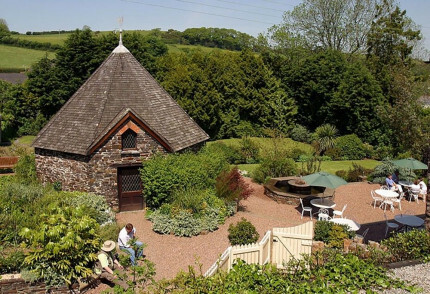 We are situated next door to Britain's best Wildlife Photography Centre, near Dingles Fairground Heritage Centre in Devon, Rosemoor RHS Garden, The Garden House, we have Homeleigh Garden Centre just up the road and much much more - some of which is under attractions on our web site. Just about anything, most of it is either made here on the farm or is very locally sourced and nearly all organic. People rarely venture elsewhere to eat as we are so well known for our food but there is the Dartmoor Inn nearby and also the Harris Arms pub. Sage gives flexibility with a large fridge, dining area and kitchenette. Lavender is great for couples wanting to share the double whirlpool bath and Dill is good for those who enjoy a separate lounge and bedroom. The estate is Soil Association registered.